I had these photos with me since years ago but I kept on forgetting to ask you about the eel that is being depicted in the photos. 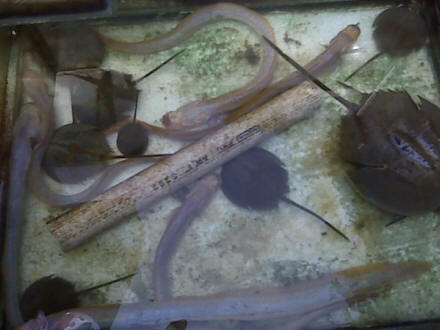 I took the pictures myself several years ago, I was talking a walk in a local fish market, when I saw some horseshoe crabs in an aquarium, together with these odd-looking eels. 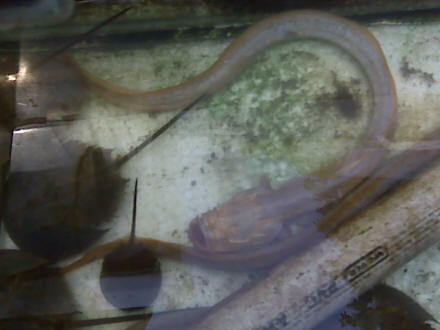 These eels are white-ish (almost pink actually), no eyes, no scales, but have fins, and have very sharp teeth. Not very long, perhaps only 20 to 30 cms. The seller told me that those eels were captured in in the river, not far from the sea (so it must have been brackish water). So, any idea what are they? They look like sci-fi alien monster thingies (due to those scary teeth and no eyes!). I did not buy them (though very tempted to) because I know practically nothing about them, their behavior, requirements for feeding etc. Someday in the future I'd love to set up a brackish water tank special for eels, so I'd like to know what my options are. <These are Odontamblyopus species, perhaps Odontamblyopus lacepedii. Thank you for the quick and informative reply! So those are not eels, but brackish-water Goby. I'll keep that in mind next time I find any of them again. Glad to know they're harmless, despite looking so fierce. body. All fish have this sense, but these gobies are specialists. I believe their giant heads are more to do with the gulping air and absorbing oxygen across the skin inside there, a useful adaptation in their natural habitat. Again, many thanks & Have a nice weekend! Thank you for the additional information about the Gobies. Very fascinating, such a humble animal but with such complex abilities. famously helping salmon migrate hundreds of miles from the ocean into remote mountain streams. And finally there's the lateral line system, which as we've discussed, is like being able to touch things from a distance. Taken collectively, this is why so many fish manage without their eyes -- unlike humans, which are strongly visual animals, for fish, eyes are just one of a whole slew of really sophisticated sense organs available to them. As for the Horseshoe Crabs, I will try to obtain more information about it. The fish market where I saw them is located in Jakarta, Indonesia, and it's still existing, so I will schedule a visit. I remember the fish guy mentioned that those crabs are "Mimi Mintuno" in local Javanese dialect, and that it was caught in mangrove forests area on northern coast of Java. Perhaps the gobies also came from the same area. 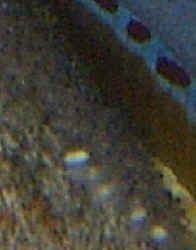 re: Desert Goby, Chlamydogobius eremius from Australia. 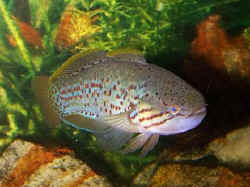 I was wondering if I can place a desert goby in a brackish tank that will range from sg of 1.008 to 1.015. 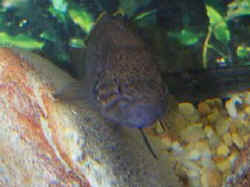 1. mudskippers who will spend most of the time on land. 2. bumblee bee gobies - will they become snacks to the dessert goby. As a mudskipper tank is always shallow. Will that level (or volume) of water meets the desert goby requirements? Hi, my name is Susan. I have a BW tank for my dragon goby. He is about 14" long and pretty thick. 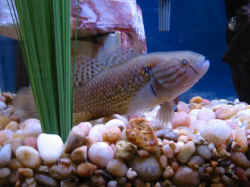 We also have hollow rocks that make great caves, especially when the dragon goby was smaller. Well I was gathering up some mollies to move them to another tank and I think I spooked the dragon goby. When he didn't come out to eat, I searched the tank and found him squished inside a rock. He is not coming out and feels pretty packed in there. I can break the rock since its ceramic, but I don't want to hurt him in the process. I also thought these fish might be air breathers and I'm thinking he is probably dead. Is there a way to break the rock without hurting him? Should I break the rock? Thank you very much for your time. You guys have a great website and do a great service to the fish keeping community. I have a BW tank for my dragon goby. He is about 14" long and pretty thick. 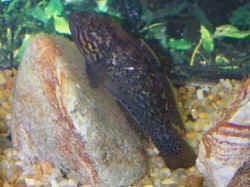 We also have hollow rocks that make great caves, especially when the dragon goby was smaller. Well I was gathering up some mollies to move them to another tank and I think I spooked the dragon goby. When he didn't come out to eat, I searched the tank and found him squished inside a rock. He is not coming out and feels pretty packed in there. I can break the rock since its ceramic, but I don't want to hurt him in the process. I also thought these fish might be air breathers and I'm thinking he is probably dead. Is there a way to break the rock without hurting him? I greatly appreciate you both for your help. Sadly it was too late for my favorite fish. Again thank you for your quick response.